Style, elegance, and creative genius are combined with talent and traditional Italian craftsmanship to create a single work of art; the Lo Pas a unique and unmistakable pen. With a stylistic concept from Lopas and technical engineering from Parafernalia combined, a new pen is crafted with a color range inspired by gemstones and different moods. Since the dawn of time colors have been associated with aspects of our personality, emotion, or state of mind. Passion for red, green for hope, white for purity... Lo Pas is an ideal writing instrument that displays life, mood, feelings, and at a glance, the character of the writers themselves. 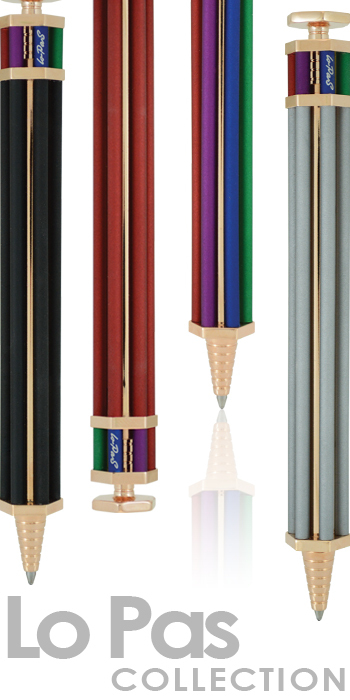 Each pen is beautifully crafted of precious aluminum rods and then anodized to perfection, plated in rose gold, and offered in 6 unique color palates, each color option symbolic of a series of moods or feelings. It is meticulously hand assembled with 30 parts. Sunny (Red) is synonymous with strength of character, tenacity, passion, and courage. For those who wish to declare their needs and desires. Classy (Purple) represents luxury, nobility, and ambition. For those who constantly challenge, whose aim is high, and those who plan far ahead into the future. Sparkly (Silver) is associated with balance and strength of character. For those looking to elegantly stand out without appearing to show off. Elegant (Black) is symbolic of refinement, mystery, and power. For those who are conscious of their value and show it proudly. Bright (Blue) is synonymous with loyalty, trust, and the evening sky. For those whose character speaks louder than words. Rainbow represents peace, serenity, and harmony. For those who are passionate about friendship and have a strong desire for closeness.